Review: Calbee Pizza Flavoured Potato Chips | Oyatsu Break! While this is in name a Japanese snack blog, it is in fact a “snacks available in Japan” blog. It’s on those merits that the various and sundry snack foods of China and Hong Kong make their way to our reviews, particularly the excellent snacks of the good folks of Calbee. I actually asked a few native Japanese folks, last time I was in Japan, about Calbee chips and they had no idea that they were products of China (Hong Kong) rather than Japan. This might be because the snack foods are just so ubiquitous–like Korea’s Lotte products they’ve been a part of the Japanese cultural fabric that no one even considers where they’re from, let alone wonders actively if they’re products of Japan or not. I bring this up because, when I brought this up in Japan, it was kind of a big deal. Chinese products have a poor reputation in Japan, as this article about Chinese “walnuts” might illuminate for you. 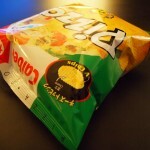 Calbee’s products, particularly their cheese and pizza-flavoured chips, are amongst the very first snack foods I tried from abroad. Familiar flavours, unique combinations, exciting execution, of course I was going to pick them up. Finding out that they weren’t from Japan was as much a surprise for me as for my Japanese friends, but they remain some of my favourite items. I’m so happy to finally be able to share them with you! 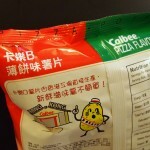 Packaging: The Calbee packging is a good mix, at least on the Pizza Chips, of English and Japanese writing. PIZZA is emblazoned across the bag in huge letters, alongside some fairly complicated kanji, and “pizza – potato” along the top and bottom edges of the bag. 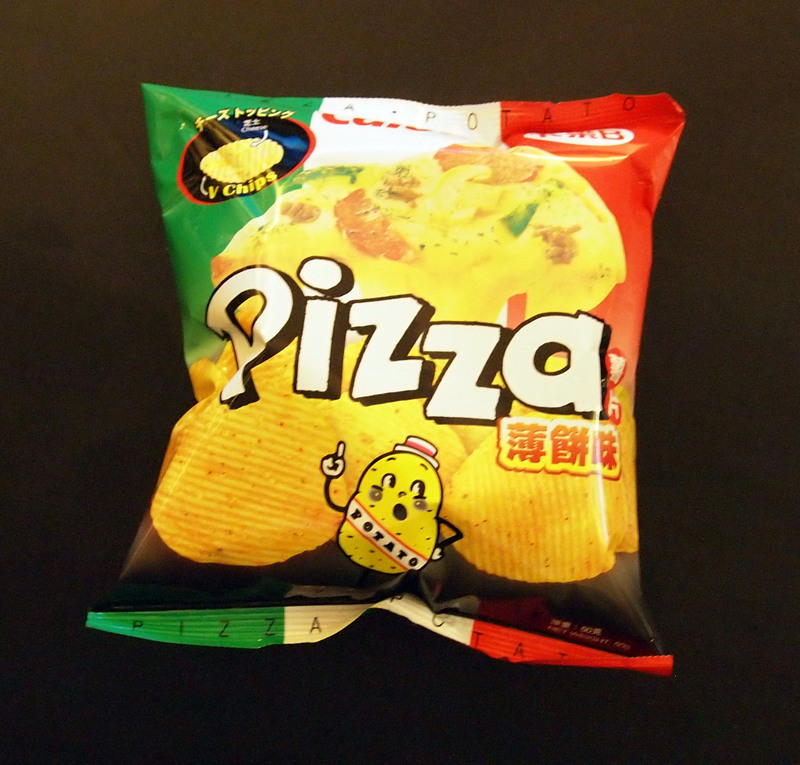 A big photo of pizza, along with photos of the chips themselves adorn the bag, having this hit more-or-less all the marks for good package design. My complaints might be that there’s no hint of the foil shininess that grab the eye on the exterior of the bag. Easily the best part of the packaging though, is this inset illustration showing that the surface of the chips is dotted with REAL MELTED CHEESE, JUST LIKE A PIZZA, and I can assure you that it was this feature that catapulted me from skepticism into a purchase on this particular item. Melted cheese! On the chip! In the bag! It’s like… the future! 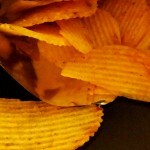 Taste: I don’t know about you but I always find myself disappointed by ‘complicated’ potato chip flavours. I like black pepper and lime chips, because they taste like black pepper and lime chips. It’s a neat idea, well executed. But as soon as you get into “taco” chips or “hot wings” chips or whatever, you’re basically asking for disappointment because there’s effectively no way to communicate heat, texture, and that range of flavour in a chip seasoning… much like the scent above. But Calbee sure can give it their best shot! 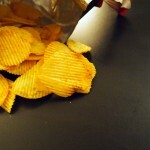 The chips themselves are well cooked–crisp ruffles-style chips, fried in oil. Nothing special but certainly not cheap like the off-brands at the supermarket. The chips are coated in all kinds of seasonings (the bag identifies “vegetable seasonings” and “beef powder”) and they do a good of delivering a very full range of flavours, somewhat complicated in their execution. It lacks the directness of black pepper and lime, or jalapeno and cheese, but it’s at least as good as a really good “all dressed” potato chip, with a little more depth of flavour. But the best part, the part that ties it all together, is that the chips really do have little clumps of melted cheese (“cheese”?) on them, and it’s surprising how that little hit of texture and flavour really elevates these. These are sweet, salty, spicy chips (with no vinegar tang, incindentally) that get a big flavour boost from the melted cheese and beef & cheese seasonings used. They’re delicious, one of the most delicious types of chips I’ve tried, and if you needed any more convincing let me reveal the secret: these are incredibly unhealthy. 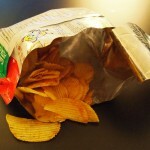 A 90g bag is 500 calories and has 34g of fat. It’s basically like eating a big mac, in delicious, goes-great-with-beer, potato chip form. What I’m saying is, these are a ‘sometimes’ food. Say, every 3-4 months. Verdict: These are hard not to love, and far too easy to love every day. Luckily, despite being prepped and ready for international distribution with lots of English packaging and a wide-ranging distribution network, they’re still limited to Asian grocery and candy stores, so unless those places are a part of your day-to-day life you’re going to have to go looking for them, and that’s usually just a bit too much work when you can pick up a bag of cool ranch at the corner store ;). 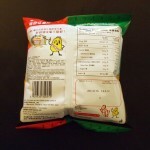 Calbee is actually a Japanese brand, and yet those chips are made in Hong Kong, they also make them in Japan in a different package.